Textile chemical products range from highly specialized chemicals (biocides, flame retardants, water repellents, and warp sizes, for example) to relatively simple commodity chemicals (such as bleaches) or mixtures thereof (such as emulsified oils and greases, starch, sulfonated oils, waxes, and some surfactants). Several thousand textile chemical specialties are sold, many of them quite similar and differing from one supplier to another merely in trade names and prices. Because of the nature of the chemicals involved, assessment of market sizes is very difficult and, at best, gives estimates based on published statistics on fibers and textile production and typical application levels required for specific process steps. 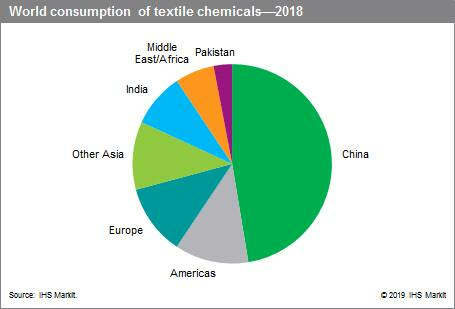 China was the largest consumer of textile chemicals, accounting for close to half of the global value in 2018. China has become the largest market for textile chemicals, based on the ever-growing apparel and textile production, and on the huge production of synthetic fibers and cotton. North America was the second-largest market for textile chemicals owing to the higher value of chemicals consumed in the United States as finishing agents and as binders and coatings in the nonwoven and carpet industries. China, India, and the United States were the largest consumers of chemicals on a volume basis in 2018. Although China continues to be one of the fastest growing markets for textiles and chemicals in the world, the pace of growth is slowing. China became a leader in world apparel and home textile (towel and sheets) production because of its low-cost labor compared with other countries. However, rising labor costs are becoming a concern. In addition to escalating production costs, government regulations are impacting the volumes and types of chemicals that can be used in China’s textile industry. Textile production and chemical consumption have shifted to Asia (outside Japan, South Korea, and Taiwan) and away from the traditional production centers of the United States, Western Europe, and Japan. These regions have suffered from the loss of their traditional export markets and major increases in imports, mainly from Asian countries. The only textile segments in the United States, Western Europe, and Japan that have remained unaffected by this geographic shift are the production of carpets, tire cord, technical textiles, and nonwoven fabrics. India is trying hard to pursue China, but its success will depend on how well marketing in export markets and production with low-cost labor can be linked. In the case of the developed regions, the keys to survival for the US, European, and Japanese textile industries are high-fashion apparel and interiors, carpet, and technical fibers. In terms of product types, surfactants are the largest chemical category consumed in textile processing. Surfactants are used in many different functional textile formulations and operations as scouring agents, dyebath additives, and softeners. In 2018, surfactants accounted for close to 30% of the total global value of chemicals, followed by coatings and warp sizes. The industry is developing new textiles with smart functions that include high-performance and protection materials, using nano- and biotechnology know-how, specialty coating and lamination formulas, and ink-jet printing processes. New products are found in industrial and medical textiles, in geo- and agrotextiles, in construction and interior textiles, and in wearable electronics. Clothing is specially treated to give it unique selling points such as wrinkle-resistance, stainresistance, antimicrobial properties, and a soft finish to provide extra comfort and performance. Trends in the textile and apparel industry include the development of products that provide comfort, wellness, freshness, and care. The greater use of leisure and sportswear is promoting the use of antimicrobial finishes in order to prevent odor problems generated by bacteria in perspiration trapped in clothing, socks, underwear, and T-shirts. Cyclodextrins—a cyclical sugar-type molecule—help capture unpleasant odors such as sweat. Microencapsulation technologies contain moisturizers, deodorants, and repellents that release their active ingredients by gentle rubbing, not during multiple washings. Ongoing concerns about the use of chemicals in the textile industry have prompted increased research into sustainable alternatives. An increasing number of apparel brands and retailers are committing to the removal of hazardous chemicals from their supply chains. In response to customer demand, textile mills and their chemical manufacturers are working together to adopt zero-discharge of hazardous chemicals (ZDHC) policies and to find solutions to produce environmentally benign chemicals or reduce chemical use in all phases of textile manufacture.